December 5, 2013 – Episode 10 – A new grandfather speaks out on health and lifestyle! Dr. Ritu Rao, a dentist and mother from Dallas, TX calls in to tell her story and to let out a LOUD SCREAM! Dr. David Madow tell his story about traveling to Jacksonville, Florida and what happened at the airport. He also shares his experience about finishing the NCR Trail Marathon in Baltimore County, Maryland. 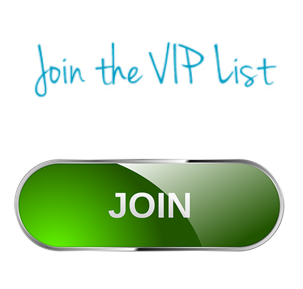 Dr. Dave asks that you share the podcast with at least one friend or family member that you would like to see get a little healthier. We are going to be starting a “Baby Steps” program very soon and we want to help as many of you and your friends/family as possible! Take a listen to the show. Download it and throw it on your iphone or ipod and listen to on the go in your car or while you are going for a run or walk inside or outside. Live Stronger, Healthier, and Happier! I made a quick trip down to Florida with my wife to visit my daughter and her husband to meet my very first grandchild, baby Jeremy! It is quite an amazing feeling! I don’t feel like the old old school grandpa in the rocking chair reading a book. I am a grandpa that feels half my age who runs marathons and skis black diamond runs. I ran a marathon over the Thanksgiving weekend. I try to run 2-3 marathons a year. This time it was the NCR marathon in Baltimore Maryland on one of those Rail to Trails corridors. It was a blustery cold morning and my wife and I got up at 4am to get ready for the marathon in 18-20 degrees cold. We were waiting before the race in a local elementary school and it was so fantastic to be surrounded by fit, positive, healthy people. My wife and I run to be healthy and have fun. No matter how fast or how slow you run; you are a runner. No matter how fast or how slow you finish a marathon; you are a finisher and you are a marathoner. You all get the same medal at the end. I don’t get caught up in a time or place in the pack or runners. I feel fantastic I did this and glad I did. Rails to Trails is an awesome non-profit organization that converts old rail lines to trails for a healthier life. The Baltimore area has a yearly marathon and my wife and I ran their 24th annual marathon this year. More information North Central Railroad Trail Marathon: http://ncrtrailmarathon.com/home.aspx. Dr. Ritu is a 38 year old mom, dentist, and a runner. She was tired of being tired physically and mentally. She wasn’t loving life, feeling exhausted, and had 30 pounds of leftover weight from the last pregnancy. She started with a coach potato to 5k program she found online and then got bored with it so she joined a running class, then a running group. Listen to my chat with Dr. Ritu how she went from 5ks, to half marathons, and to date has run two full marathons. Running has changed her life from losing weight, to diet and nutrition, and making some great new friends from her running club. Are you one of the many people who have too many pounds on your body and you want to lose weight, but you don’t know where to start? You have to start today, not tomorrow, not after the holidays, not in the New Year. The first step is to stop eating the junk! You can stop that right now. Every bite you put in your mouth is a choice. Make good choices with all food that goes into your body. I am creating a program called Baby Steps to help you my friends get in the best shape of your life and slice your age in half! More details forthcoming about this program. You never regret the workout, walk, run, or bike ride you did. I promise you that you will regret that workout you did miss. Sometimes the hardest step is convincing your mind to do this and get out of that warm bed especially in the cold weather and get those shoes on and get out the door. You want a better, strong, healthier life – and it starts with you and starts with those first steps! Did you enjoy today’s show? Do you have any questions for me? 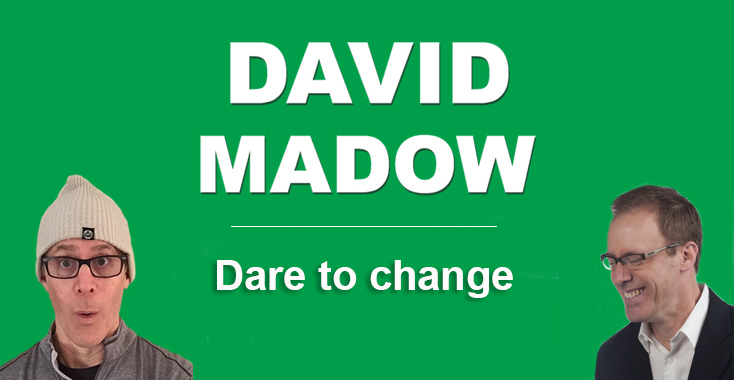 Connect with me on Facebook at http://www.facebook.com/davidmadow. Do you have a friend that needs to hear this show and live a better life and slice their age in half? Share this show with them and send them to http://www.sliceyourage.com. November 28, 2013 – Episode 09 – Howard Farran is a special guest on the show today. The Phoenix, Arizona resident talks about he went from an overweight out of shape dentist to an Ironman Triathlon finisher. His story is sure to amaze you as well as inspire you! Also on today’s show your host Dr. David Madow gives some more holiday eating tips, shares a really cool breathing exercise, talks about what you can do if you have a short work break, and much more. This is a special “not to be missed” holiday episode that you may listen to and share with your friends. Take a listen to the show. Download it and throw it on your iphone or ipod and listen to on the go in your car or while you are going for a run or walk. Do this daily first thing in the morning and during a break at work. This special breathing practice was taught to me by my yoga instructor to create peace and calm and de-stress. – You can get distracted and not pay attention to what is going in your mouth while visiting and the next morning have the scale hangover and not be happy when you step on the scale and regret overeating. – This is your life and your friends and family may not be on a plan or care about being healthier, but you do and that is why you are listening. This is a lifestyle I am teaching and not a crash diet or quick fix. – TIP: When things are passed around, just take a little bit and pass it on. Your body doesn’t know it is a holiday and is not ready for you to eat two or three times what you normally do. – Be good I am watching you! Remember it is your body and you need to respect it, not abuse it, and take care of it! What an inspiration! He went from overweight workaholic to triathlete. He wanted the biggest baddest goal he could find; the goal that scared him the most = a Triathlon. He announced his goal and told all of his family and friends and they all laughed. This motivated him even more and he remembered this when he heard that alarm go off at 4am every morning. Every year from ages 40-50, his goal was to lose 10 pounds. Then at 50 years old I was 5’ 7”, 238 pounds a good 50 pounds overweight, and a workaholic. He woke up at 50 I wanted a big goal to live a better healthier life. He couldn’t swim one pool length for 2 minutes, he couldn’t run around the block, and could only do 6 miles on a bike. Then 11 months later just before his 51st birthday he completed his first Iron Man race. He decided every day to workout and bike, swim, or run. The only place he could find consistently to workout with no problems, interference, or excuses was 4am. This had an amazing effect of getting him to bed early and sleeping well and stopping late night eating. He never planned a rest day, but life interferes with family, life, and travel provided an unplanned down or rest day. Take a listen on to my chat with Dr. Howard Farran, full-time dentist who changed his life. You don’t drive around not knowing how much gas is in the tank of your car. You need to step on the scale daily to know where you in your life and measure your success. I travel a lot and even do this on the road. I use the Newline travel scale and got it off Amazon for $20 bucks and bring it on the road so I can keep aware of where I am on a daily basis. I look forward to connecting with you between these shows. The best place to reach me is on Facebook on my page: http://www.facebook.com/davidmadow. Have a great week! 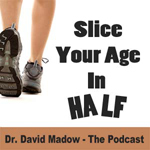 November 21, 2013 – Episode 08 – In this episode Dr. David Madow answers several listeners questions concerning exactly how much water should we be drinking every day and how to avoid the eating temptation over the holidays. Also in this episode, Dr. Madow will help you avoid the stresses that come from money, finances, marriage, relationships, and more. Finally, Mike comes into the studio to give a scream about something that he is in the process of accomplishing that will amaze you! Water is water. No other fluid counts as water. Water is the healthiest drink on the planet is water. There is no better nourishment for us to consume. You need to be mindful of this and always have water with you and stop throughout the day and drink just pure and simple water. You need to steer clear and avoid negative no nutritional harmful soda pops and sweetened juices. Get more water in your life. Here we go! Holiday eating is always a challenge even for the most healthy of us. I want to share some tips with you to make things a bit easier this holiday season. First, eat a little bit before holiday events so you are not starving when you get there. Next, do your thing when you get there and don’t let anyone make you feel guilty for not eating. You are the one that is going to step on the scale in January and have to deal with that number. You can politely say no or politely say yes and take a small amount. Also, here’s a tip I have been doing for years and have had great success: Use a smaller plate – both during the holidays and all throughout the year. Even if you fill it up, it will be less than half of what you would have on a regular big dinner plate. Lastly, I want you to resist going back for seconds or thirds. Go get a drink of water or tea if you are still feeling hungry or you want to have something in your hand. Focus on the people at the party and Let’s not overeat and overdrink this season! This is your life. You need to make good choices today. Right now. What is a vision board? It is a board you look at every day focused on the vision of the life you want to have. You find pictures of the life you want and stick it where you can see it every day. It may sound silly, but it really works. It has worked for me and countless others. When we focus on the life we want, we move towards that life and those goals. It is pretty simple to get started. Go to your local office supply store for a basic corkboard or a home decorating store for a fancier one if you wish; pick one you like and put it up in a place in your home you are daily like your home office or a hallway. Next, cut out pictures that align with the vision of what you want your life to be. Some ideas for the vision board: a picture of someone in your age range with the body you aspire to have, the marathon you want to run, the project you want to start or finish from writing a book to renovating your kitchen, or the vacation or trip you want to take. Get started on creating a vision of the life you want to have and be living moving forward. More Information on Vision Boards and how to make one and how it can help your life: http://marthabeck.com/2008/07/the-subtle-tricks-to-building-an-effective-vision-board/. No matter how fast you are or slow you are – there are always runners faster and slower than you. Do your own thing, but track what you do so you can see your progress. Start with walking and running. Walk once around the block and then run once around the block. Running is great way to not only boost your metabolism, but change your metabolism. Mike decided to have a goal to run as far as going around the world once and has run 90% of his 22,600 goal miles so far. Listen to my chat with Mike and how he accomplished this goal and still is running. Money is and always will be a hot topic. It is one of the biggest stressors in people’s lives and one of the top 3 reasons why relationships end. You need to live BELOW your means. It doesn’t matter if you are making $40,000 a year, $400,000 a year, or $4 million a year. True wealth and financial success is living below your means, having savings, and having no debt. It is not the dollar amount you earn or where you are on the spectrum that is financial success. It is to live below your means and take care of your debt and put money in savings that is success and freedon. If you do these simple things, you will be amazed at what happens to the stress level in your life. You need to have a map and plan. Listen to Dr. Dave talk about how money can stress out your life and how you can be debt free and not be a slave to the bank and your debtors. If you can fix it, do it! Do everything you can to fix it. Nowhere does it say you have to be with someone or have someone in your life that is toxic. If you cannot fix it, get out of it. It will change your life to get the negative people and negative energy out of your life. I love doing this show. I want you to be better, stronger, and healthier in all aspects of your life. Thank you for taking time to spend time with me today. I look forward to connecting with you between these shows. The best place to reach me is on my Facebook page http://www.facebook.com/davidmadow. Have a great day and a great week!